Excellent village location, patio, garden, 2 bedrooms +1 double sofa/bed, 2 WCs. The apartment is ideally located on the ground floor.It has one double bedroom and one bedroom with bunkbeds. The comfortable lounge area also benefits from two pull-out beds.The lounge leads to the private patio and communal garden,which are particularly pleasant throughout the seasons.The bathroom fitted with shower and WC has been entirely refurbished in October 2010.There is a separate additional WC.The apartment is conveniently positioned between the main ski-lifts (approx. 500 metres) and the nursery slopes (approx. 200 metres) and a short walk to either. It is also ideally situated in the centre of Les Houches, a few metres from the regular free bus, which serves the best ski areas within the Chamonix valley. It is within a minute of the tourist office, main square,shops (incl. supermarket) bars/restaurants. Skiing Les Houches: Les Houches is the largest of five separate ski areas in the Chamonix valley and was host to the world cup downhill in January 2003. The skiing is very pretty with many mini off-piste runs through the trees. It is primarily intermediate in standard although there are some pleasant and relatively easy ‘blues’ for second year skiers. It is linked to the other ski areas by a free bus service. Brevent/Flegere -linked by a cable car. A good mix of mainly intermediate runs with excellent views towards the Mont Blanc. Argentiere - Legendary ski area, famous amongst advanced skiers and off-piste connoisseurs although there are blues and reds in this area. Le Tour - Right at the top of the valley Le Tour is a wide open expanse of skiing with easy wide open pistes. Walking and climbing : The possibilities for walks and climbing are endless . There is a bathroom with shower and WC. Also, additional separate WC. Bathroom completely refurbished in October 2010. Patio looking onto communal garden. Outdoor table with 6 chairs. Very private area. There is an additional small folding armchair/bed in the hall area. We can provide bed linen if you wish but there is a charge for this. The cost of bed linen is 7.50 pounds per single, 10 pounds per double, max. 30 pounds for the apartment. Duvets and pillows are provided but it is essential that you either to bring your own bed linen ( duvet covers, sheets and pillow cases) or to hire them from us. . We regret that, for reasons of hygiene.the use of sleeping bags of any sort is not acceptable. 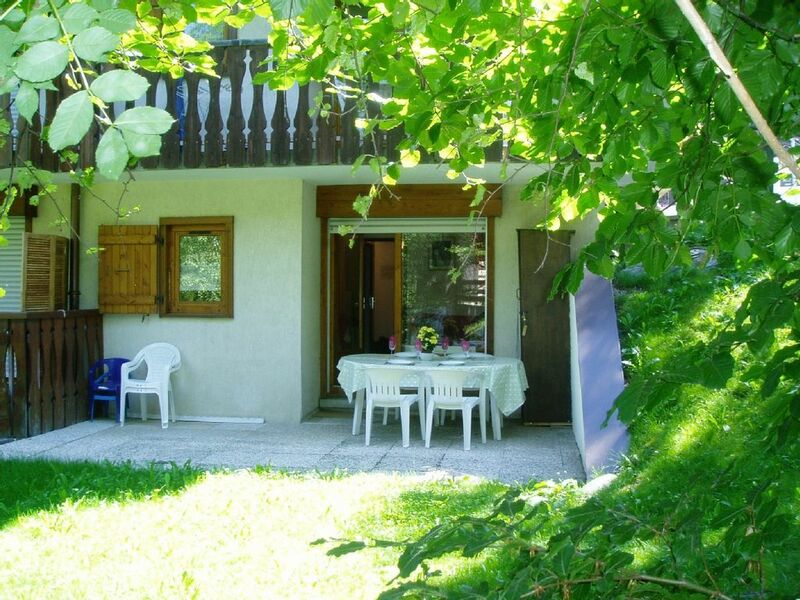 Je recommande cet appartement qui est idéalement situé en plein centre des Houches, très bien équipé, calme et agréable grâce aussi à sa petite terrasse privative. Les propriétaires sont à l'étranger mais tout est bien organisé pour l'arrivée et le départ. We stayed here for a week and had a wonderful time. The apartment is ideally located 2 minutes from the tourist office, free bus stop and supermarket. There are games DVD's and puzzles to keep you amused if the weather is bad however we had great weather and went out every day! The kitchen is tiny but we were able to cook for the three of us each evening and enjoyed eating out on the patio. The only downside was there is no english TV channels to watch and as we do not speak french we had a non TV week (some might say a positive!) The bunk beds were hard however I have been assured that the mattresses have now been replaced so I would recommend this apartment to anyone who likes peace, quiet and beautiful views. The owner was exceedingly helpful and replied to my emails very prromptly. Thank you for you comment. We have replaced the bunk bed mattresses. We are always welcome and use our guests' reports and endeavour to provide comfort and "good value for money "
This apartment is very practical with everything required to make a pleasant stay. Ideally located between the two ski lifts in Les Houches where there is skiing for all and ideal for a family ski holiday. The bathroom has recently been updated and consists of a modern shower. The property is well maintained and excellent customer service is at hand. Having booked for our 3rd year we would totally recommend this apartment to friends and relatives. There is a supermarket very close by and restaurants and shops, there is also a very nice Takeaway Pizza kiosk within walking distance.